All aboard as we visit Bressingham Steam & Gardens, ride on the 'Poppy Line' and spend time in the seaside town of Cromer. 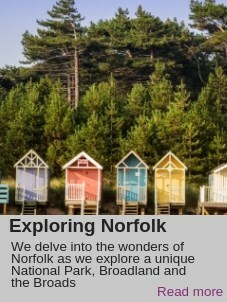 We also visit classic Norfolk attractions - Sandringham & Norfolk Lavender, St Georges Distillery, home of English Whisky. 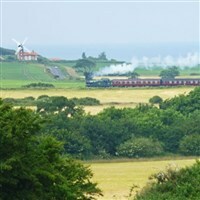 All aboard as we visit Bressingham Steam & Gardens ride on the Poppy Line and spend time in the seaside town of Cromer. We also visit classic Norfolk attractions  Sandringham & Norfolk Lavender, St Georges Distillery, home of English Whisky. We depart from your home with our exclusive door to door pick-up service; we journey to Norwich with a visit to Springfields Outlet Centre in Spalding enroute. Arrive at your hotel late afternoon, time to relax before dinner. This morning we visit St Georges Distillery, home to the English Whisky company, the distillery was designed and built by the Nelstrop family for the specific purpose of producing the finest English single malt whisky. Our guided tour includes tea/coffee on arrival, tour of the distilling floor and No.1 Warehouse and a taste of some of the single malts. In the afternoon we call into Bressingham Steam and Gardens where you can admire the collections of vintage locomotives and a National Dads Army collection, plus there are a number of model railway journeys to choose from (tickets not included can be bought on the day). The train ride is a great way to appreciate the views over the 17 acres of gardens. This morning we travel to Sandringham House, the much-loved country retreat of the Queen. A highlight is the opportunity to see the actual rooms where the Queen spends time when she is in residence, dont miss the fascinating museum and the collection of vintage and recently retired motor cars. We then travel the short distance to Norfolk Lavender, famous for its gardens, oil distillery, national lavender collection and herb garden. Today we head to the picturesque north Norfolk coast, our first stop is the bustling seaside town and holiday resort of Cromer where there is plenty of time to explore the narrow twisting streets or take a walk along the pier for a cup of tea in the Pavilion Theatre. In the afternoon we take a 10 mile round trip on the North Norfolk Railway, this heritage railway is known as the Poppy Line, a description given to the railway because of the many fields of poppies the line passes through. After breakfast we depart our hotel for our homeward journey with comfort stops enroute. · Admission Bressingham Steam & Gardens. Situated on the outskirts of the city the Holiday Inn offers free WiFi, indoor pool, restaurant, bar, lounges. Bedrooms are modern and feature flat screen TV, hairdryer, tea/coffee making facilities. Starting your holiday with our exclusive home pick-up service, we journey to Norwich with a visit to Springfields Outlet Centre in Spalding enroute. Arrive at your hotel late afternoon, time to relax before dinner. This morning we visit St Georges Distillery, home to the English Whisky company, the distillery was designed and built by the Nelstrop family for the specific purpose of producing the finest English single malt whisky. Our guided tour includes tea/coffee on arrival, tour of the distilling floor and No.1 Warehouse and a taste of some of the single malts. In the afternoon we call into Bressingham Steam and Gardens where you can admire the collections of vintage locomotives and a National Dad's Army collection, plus there are a number of model railway journeys to choose from (tickets not included can be bought on the day). The train ride is a great way to appreciate the views over the 17acres of gardens. This morning we travel to Sandringham House, the much-loved country retreat of the Queen. A highlight is the opportunity to see the actual rooms where the Queen spends time when she is in residence, don't miss the fascinating museum and the collection of vintage and recently retired motor cars. We then travel the short distance to Norfolk Lavender, famous for its gardens, oil distillery, national lavender collection and herb garden. Today we head to the picturesque north Norfolk coast, our first stop is the bustling seaside town and holiday resort of Cromer where there is plenty of time to explore the narrow twisting streets or take a walk along the pier for a cup of tea in the Pavilion Theatre. In the afternoon we take a 10 mile round trip on the North Norfolk Railway, this heritage railway is known as the 'Poppy Line', a description given to the railway because of the many fields of poppies the line passes through.